Capture Vietnam’s fascinating culture and natural beauty on this eight-day adventure. Explore the bustling capital of Hanoi, cruise through the spectacular kart peaks of Ha Long Bay and admire the picturesque architecture of Hoi An. Daily departures until 31 Dec 2019, subject to availability. Then go on a culinary whirlwind this evening, sinking your teeth into the flavours of the North on a street food tour through the alleys of the Old Quarter. Strolling along to the local night market, watch the bustle and array of goods on display, before setting off into the maze of alleys. Here, stop at a famous pho stall to slurp up this world-renowned beef noodle soup, before grabbing a stool at the neighbouring Bia Hoi Corner. Watch the commotion of this spot as it comes to life in the dark while sipping a tall glass of cold local draft beer. Continue wandering and take in the sights of various curbside businesses that only open at night. Try some delicacies such as savoury steamed rice rolls with wood ear mushroom and pork, a classic Vietnamese sandwich, freshly grilled chicken wings or other snacks that make your stomach rumble! See firsthand the city’s obsession with barbecues before finishing things off with some dessert. Take a bite of fresh tropical fruits over shaved ice, drizzled with condensed milk as a perfect way to finish off this street food tour. From Hanoi, set off toward Halong Bay just a few hours away. On arrival, board the Emeraude and after settling in, head to the sundeck for a refreshing welcome cocktail and buffet lunch. Today the boat floats toward a collection of the Bay’s best sights, including Sung Sot Grotto – also called Surprise Cave. After a light snack, in the summer, visit Ti Top island for swimming or hiking or you might visit pearl farm in winter. In the evening, roll your sleeves up for a cooking demonstration and class on the sundeck, and squid fishing from the stern after the sun sets. Or, spend your night inside with a showing of Indochine, a classic film set in the scenic bay. Wake with the sun and enjoy coffee, tea and cookies on board as the horizon brightens. This morning if weather permits, in the summer, visit a pearl farm to see how these precious ‘stones’ are farmed or in winer you can visit Ti Top Island. Back en route to the port, pass by Halong Bay and its stunning islets before disembarking and then heading back to Hanoi airport. 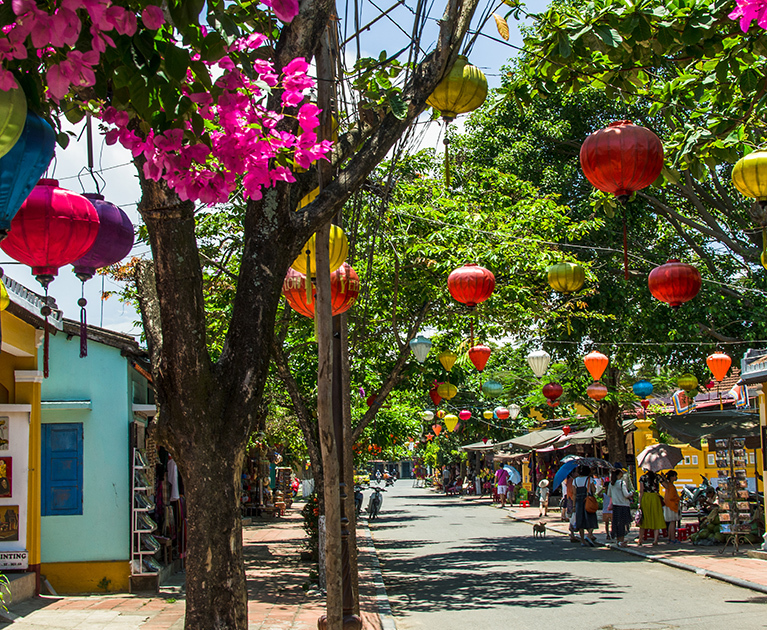 Begin your tour of Hoi An, a former trading port that welcomed Chinese, Dutch, French, Japanese, Portuguese and Arab merchants between the 16th to 18th centuries. Today Hoi An is famous for its restored architecture, homemade silk, expert tailors and delicious noodles and seafood. Its relaxed vibe and pedestrian streets make this town a pleasure to walk around and discover new things. The tour includes stops at several famous landmarks. The first is Chua Ong Pagoda, dating back to 1653 and built in honour of the Chinese general Quan Cong, who is worshipped by many as a symbol of loyalty and justice. Next, pop into Phuc Kien Assembly Hall, to see the Jinshang Temple which is dedicated to the goddess of the sea and the protector of sailors. From there it’s a short walk to Tan Ky House, a 200-year-old ancestral house and finally, stroll across the often photographed 17th century covered bridge built by Japanese craftsmen. The beautifully built bridge doubles as a temple and is a major landmark of Hoi An. End your afternoon with a boat trip along Thu Bon river. Advertised prices are per person, twin share, tour only, correct at time of publication and are subject to availability, withdrawal and change at any time without notification due to fluctuations in charges and currency. Offer valid on new bookings only. ^Exclusive bonus is included in the advertised price. A deposit of 20% is required within seven days. Final payment is due six weeks prior departure. 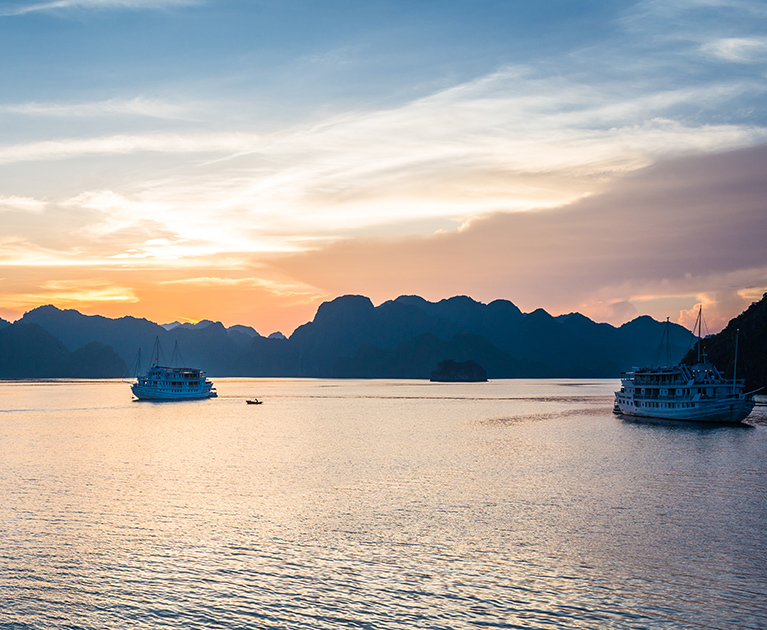 Halong Bay cruise: Local authorities have the right to delay or cancel the cruise at any time, even after the tour has departed if they feel the current or forecasted weather conditions are not suitable. Other conditions apply. Please contact your personal travel manager for full terms and conditions.